Hawaii Five-O superfans from all around the globe are gearing up for what promises to be an extraordinary night Saturday, as the cast and producers of the popular drama descend on Waikiki for the Hawaii Five-O Premiere at Sunset on the Beach. AlohaBruce from Hawaii Aloha Travel is one of only a few, carefully selected reporters allowed ON the red carpet himself. From this amazing vantage point, he’ll greet the cast and report to you LIVE via Periscope. Can’t make it to the event? No worries—Aloha Bruce will keep you informed of all the night’s events with wall-to-wall coverage. From pre-premiere festivities to post-premiere parties, he’ll be there with all the Hawaii Five-O happenings, in real time. Expect Aloha Bruce to get the answers to the questions you’ve always wanted: What does the cast love about Hawaii? Will they stay here, even after the show ends? What kind of connection do they have to Hawaii culture? Aloha Bruce is prepared to ask these, and other, personal questions to the cast and producers of the show. 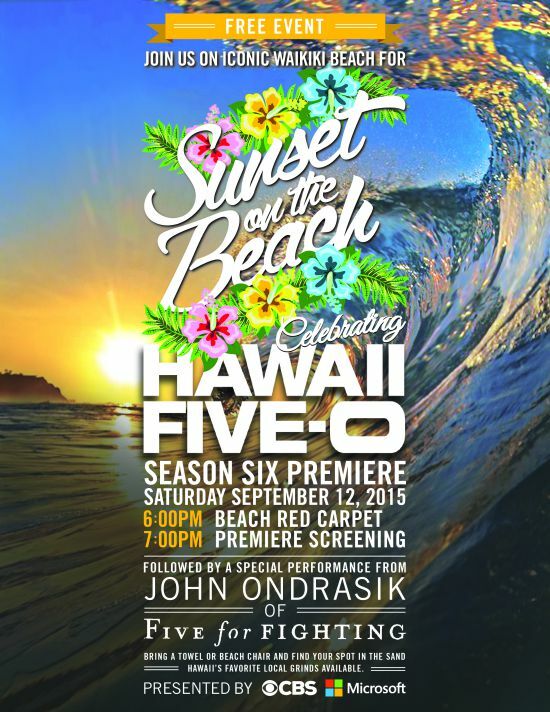 This year, as in year’s past, the “Hawaii Five-O” premiere event will take place at Queen’s Beach. The 2015 event kicks off the show’s sixth season. Special guests include the show’s cast: Alex O’Loughlin, Daniel Dae Kim, Grace Park, Chi McBride, and Jorge Garcia. There will also be musical guest performance by John Ondrasik of Five for Fighting. All the major cast members are expected to attend the premiere, and you have the opportunity to see them in person...if you get there early. As an added bonus for superfans, Hawaii-Aloha Travel is hosting The Ultimate Hawaii Five-O Superfan Tour Sunday for more than fifty fans of the show. The lucky participants will visit a host of exciting stops, such as the King Kamhehameha Statue, Kelly’s house, Waikiki, the studio, the Jack Lord Statue, Rachel’s house, Bobby’s Market, Waimanalo (Sherwood Forest), the Department of Defense (Hawaii Five-O Police Department), and the Bayer Estate. Executive Producer Peter Lenkov announced he’s giving away an uber-generous gift bag to one lucky fan (it’s the same gift bag the cast members will receive). It includes a tote bag from Aloha Collection, Maui Divers jewelry, and a Microsoft Band, among other goodies. Just go to the Hawaii News Now Facebook page and “Like” the page. You’ll then be entered to win it. The poster for the premiere says it all: a star-studded event is planned. The season premiere for television airs on KGMB September 25th at 9:00 ET/8:00 CT. Whether you’re a fan of the show or just a fan of a great party, grab your beach blanket and get there early. You won’t want to miss this Hollywood-Comes-To-Hawaii event!